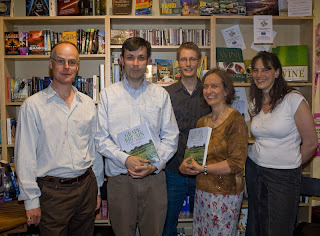 Somewhat after the event, but now with some excellent photos kindly supplied by Harriet - on Friday May 23rd we did our first ever wine event in the shop - and it's something we'll definitely do again, if only because it was a lot of fun. 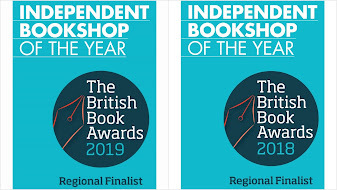 I'm sure that if we'd have done a straight wine-tasting (with a few wine books dotted around the place) it would have been a decent event. 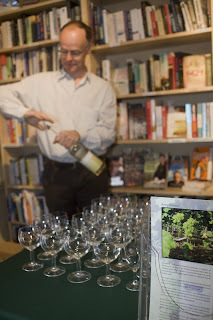 Similarly, if we had done a straight author event, possibly with a bit of English wine to taste, that would have been OK too. But doing them both together worked extremely well. It helped that the two people we had - Richard Liwicki (from Bothy Vineyard) and David Harvey (author of Grape Britain) were so passionate about English wine, and were such great speakers on the night. On arrival, everyone was welcomed with a glass of Bothy's Oxford Dry. Honestly, you just cannot believe that wine of this quality, which one of our customers (who knows about these things) favourably compared to a good Sauvignon Blanc, could be produced less than five miles from Abingdon. Fantastic. Richard kicked off proceedings introducing this wine, and a red from another English vineyard. 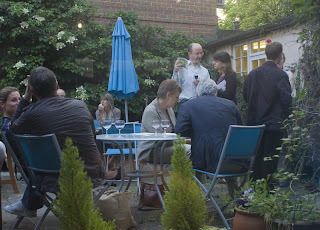 The pleasant evening meant we could make full use of the garden to ensure a relaxed tasting environment. Then it was time to introduce David Harvey. David's story is really inspirational. He worked in a branch of Oddbins in Leeds, and was amazed to discover a great little vineyard close-by. This epiphany made him give up his job, and - completely off his own bat - chose to spend a year travelling around the country visiting as many vineyards in Great Britain as he could (in his battered Corsa, largely cadging places to stay from friends, etc.). 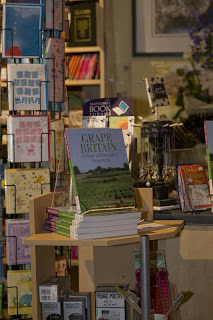 The result - published in May by Angel's Share, an imprint of Scottish whisky publishing specialist Neil Wilson - is Grape Britain, a wonderfully-produced guide to many of the now almost 300 vineyards in this country. 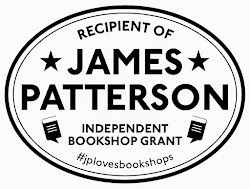 The book has developed a bit of momentum since its publication. David had just found out that the BBC had requested a copy of the book as a reference for Oz Clarke and James May's next series, a road trip around Great Britain. 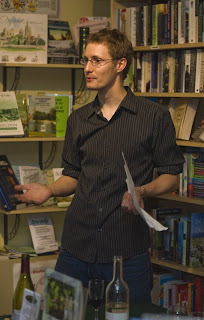 He confessed beforehand that he wasn't great at public speaking, but he needn't have worried - the guy has so much enthusiasm for - and is so knowledgable about - English wine, that he was very entertaining to listen to. 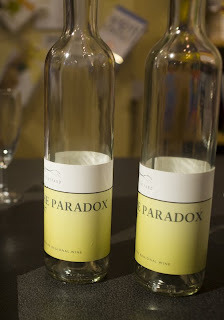 We then had the final wine from Bothy - the extraordinary Paradox (visit Bothy's website and click on "our wines" to learn more about how the disastrous 2007 Summer floods played a part in its creation). 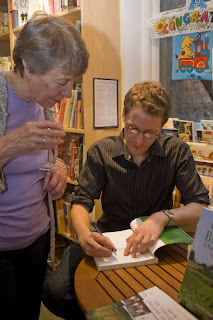 The evening continued with more tasting, and David signed copies and chatted about wine for the remainder of the evening. Thanks to Sian and Richard from Bothy for working so hard on organising such a wonderful tasting, and to David for travelling up from London and making the event such a big success. Thanks also to Alison for putting together some exceptional nibbles in the children's room. As I say, we're definitely doing this again...it was too much fun! Please, please do this wine event again. It was the one thing that I would have had no need to drag my husband to. We both really wanted to come but we were away. How about a winter taster pre Xmas?